After receiving his Master's degree in Electronics in 1975 from the renowned College of Engineering in Pune, Mr. Vaidya worked for Cummins Engine Co. (KCL) as a Research & Development Engineer. He was responsible for the development of variety of specialized sensors and Instrumentation systems required during the testing stages of advanced engines. He designed and developed special purpose piezoelectric sensors for measurement of dynamic pressure, acceleration, force, stress-strain and torsional vibration measurements. 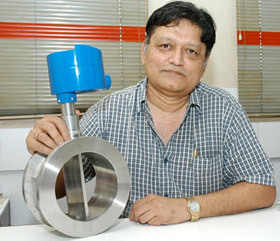 His experience in designing customized and specialized transducers and desire to manufacture sensors with the best performance was the motivation for custom-made sensors for Vortex Flow Meters which he eventually started manufacturing indigenously; after establishing his own firm INCONEL, in the early 1980s. Mr. Vaidya has been awarded several patents in India and the United States of America for radical inventions in the field of sensors and flow meters. At INCONEL, Mr. Vaidya continues his efforts for innovation in sensor technology and flow metering solutions for the Industry. Mr. Joshi studied Mechanical Engineering from the reputed Visvesvaraya Regional Engineering College, Nagpur (now VNIT, Nagpur). After having worked early in his career in Automobile and in Electronics Industries, Mr. Joshi joined INCONEL in 1994 as a Sales Engineer. Since joining the company, he has worked extensively on expanding the company's presence in Industry and presently oversees all Sales & Marketing Operations.